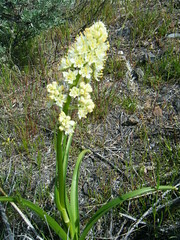 Meadow death camas has a single stem, eight to twenty inches tall, with long four to twelve inch grass-like leaves at its base. At first the flowers form a rather dense pyramidal cluster. Later the cluster becomes more elongate and the individual flowers more widely spaced. The flowers can be white, cream-colored, or pale yellow. The plant grows from a bulb that looks like an onion but does not smell like an onion. The slightly elongate bulb buries itself progressively deeper as the plant ages. Death camas contains several complex poisonous alkaloids and Native Americans called it the “poison onion”. The entire plant is potentially lethal if eaten. Even honeybees can be fatally poisoned from feeding on the nectar. The symptoms of poisoning include dizziness, nausea, and profuse vomiting. The Native American antidote was ingesting large quantities of fish oil. Death camas often grows in the same habitat as blue camas, an important food crop for Native Americans. No one would mistake the small white flowers of death camas for the big blue blooms of camas, but mistakes occurred when the two populations were intermixed and both had gone to seed or withered—the time when camas bulbs were best for eating. If great care was not taken, the similar looking, but very poisonous death camas could be collected by mistake. Blue camas fields were often weeded of death camas to reduce the risk and make harvesting easier. Death camas has killed more people in the Northwest than any other plant.